Investors gained N71bn in two consecutive days following the sustained positive performance of equities listed on the Nigerian Stock Exchange. The market capitalisation of the equities increased from N10.952tn on Tuesday to N10.965tn and N11.023tn on Wednesday and Thursday respectively. 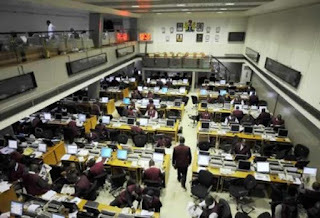 The equities market advanced by 0.53 per cent on Thursday to settle at 29,347.62 basis points following gains in bellwether stocks such as Guaranty Trust Bank Plc, FBN Holdings Plc and United Bank for Africa Plc. Following sustained gains recorded on two days, the market year-to-date return moderated to -6.6 per cent. However, activity level weakened as volume and value traded shed 45.5 per cent and 18.2 per cent to 224.028 million units and N2.013bn, respectively. The top traded stocks by volume were Zenith Bank Plc (45.4 million units), Lasaco Assurance Plc (42.3 million units) and Access Bank Plc (21.7 million units) while Zenith Bank (N927.7m), GTB (N376.9m) and Stanbic IBTC Holdings Plc (N135.3m) led the top trades by value. The performance across sectors was largely bullish as three of the five indices closed on a positive note, one closed on a negative note, while the last one closed flat. The insurance index led advancers with a 1.9 per cent gain following bargain hunting in NEM Insurance Plc and Niger Insurance Plc. The banking and industrial goods indices appreciated by 1.1 per cent and 0.8 per cent, respectively, on the back of buying interest in GTB, FBN Holdings, United Bank for Africa Plc and Lafarge Africa Plc. The oil and gas index closed flat for the second consecutive trading session despite profit-taking in Eterna Plc. On the flip side, the consumer goods depreciated by 0.1 per cent on account of profit-taking in PZ Cussons Nigeria Plc and Dangote Flour Mills Plc. Investor sentiment strengthened to 2.1x from the 1.3x recorded on Wednesday as 15 gainers outnumbered seven decliners. The top five gainers were NEM Insurance, Niger Insurance Plc, Fidelity Bank Plc, United Capital Plc and FBN Holdings Plc, whose share prices rose by 10 per cent, 10 per cent, 8.70 per cent, 6.54 per cent and 6.12 per cent respectively. The seven losers were Ikeja Hotel Plc, Associated Bus Company Plc, Eterna, Chams Plc, Flour Mills Nigeria Plc, Cutix Plc and Zenith Bank, whose respective share prices shed 9.76 per cent, 8.33 per cent, 8.05 per cent, 7.14 per cent, 2.35 per cent, 1.23 per cent and 0.73 per cent.